Is There a Snake Doctor in the Yard? 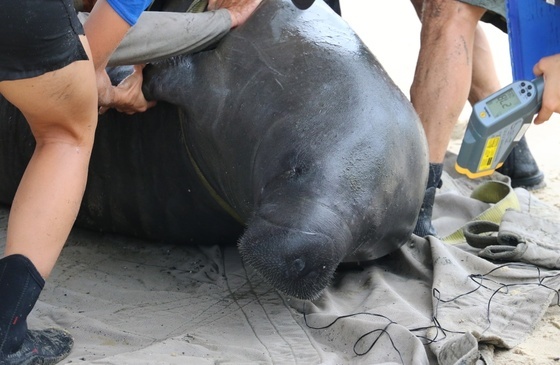 What to do when three of the manatees you’re tracking lose their satellite transmitters? Best answer: Catch and tag three more. 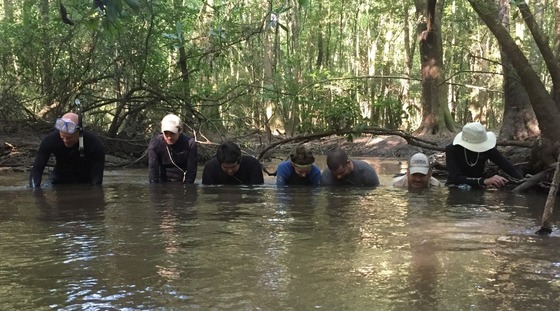 That's what cooperators in a Georgia project led by the DNR Nongame Conservation Section, Sea to Shore Alliance and Georgia Aquarium did Friday at Cumberland Island. 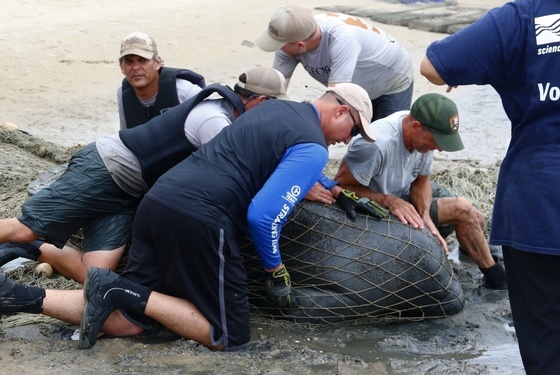 Netted, assessed and released unharmed, manatees TGA018, TGA019 and TGA020 are now being tracked along with two others tagged in May and one transmitting since June 2015, the study's first year. The aim is to better understand manatee movements near Naval Submarine Base Kings Bay, document migratory paths and habitat use in the Southeast, and collect baseline information to help assess the health of this endangered species. The hoped-for net result is improved conservation of the massive marine mammals. But when tags on three of the animals caught in May went missing or malfunctioned, the project faced manatee-sized holes in this year’s tracking results. The captures last week filled the gaps. As of early this week, all six manatees were in Georgia – even TGA011, a male tagged in 2015 that migrated south last August and didn't cross the Florida-Georgia line again until Monday. After TGA019 was released Friday, the U.S. Geological Survey discovered that the manatee had been photographed (and documented as manatee BC540) in August 2006 in Warwick, Rhode Island. And on July 1, 2009, the male had been photographed in St. Simons Island’s Dunbar Creek. Since Friday, TGA019 has traveled from Cumberland Island to Dunbar Creek. Scientists are waiting to see if he continues north up the eastern seaboard. If you see a tagged manatee, report it to DNR by calling 1-800-2-SAVE-ME (800-272-8363). Note the time, date, location, tag color and whether other manatees are present. Do not chase, touch or otherwise harass the manatee, or touch the tag. The tag is harmless to the animal. The tether and belt looped around the tail area of the manatee allow the tag to detach so the animal doesn't become entangled. Support the conservation of manatees and other nongame wildlife in Georgia by buying or renewing an eagle or hummingbird license plate. These plates cost only $25 more than a standard tag and most of that fee goes to help wildlife. DNR's Nongame Conservation Section depends largely on wildlife plates and other fundraisers to conserve nongame, native plants and natural habitats. Our yards feature an amazing array of animals. The two groups that garner most attention are birds and butterflies. 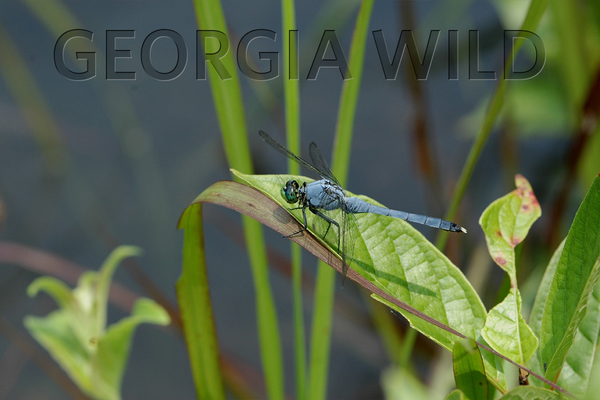 However, that lineup is slowly growing as more Georgians turn their attention to dragonflies, creatures every bit as beautiful and fascinating as the traditional wildlife headliners. 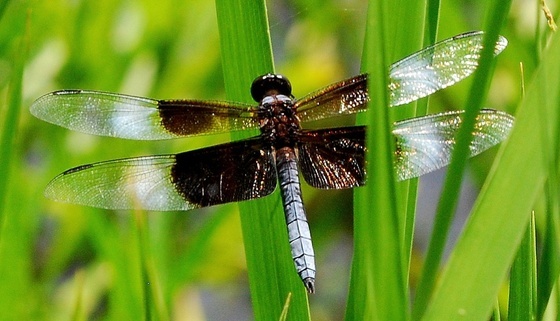 Read about the fascinating lives and abilities of dragonflies in Terry’s full column. Adult alligator snapping turtles are true survivors. A study of the species in southwest Georgia’s Spring Creek from 1997-2013 estimated survival rates as high as 98 percent for males, according to research by DNR and Auburn and Georgia Southern universities. The recently published study is the first to document a stable, viable population of these large, long-lived turtles, and provides a framework to help conserve similar species for which data is not available, authors wrote. (Also see: “How have gator snappers recovered?” Oct. 30, 2014). 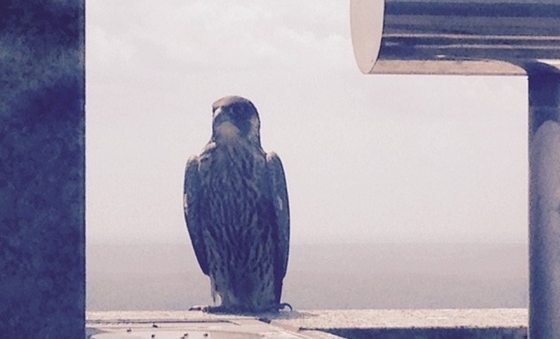 More good news on falcons: On June 29, an interpretive ranger at Tallulah Gorge State Park spotted a peregrine eyas at the park’s cliff-side nest. Because young hadn’t been seen this season, there had been concern the nest had failed. Ospreys continue to court in, add to and simply hang out at The Landings nest used this winter by great-horned owls and streamed online. Nongame’s Bob Sargent said it’s possible the couple adopted the site after experiencing a nest failure earlier, though it's too late in the year to expect eggs now. Shout-out for snakes? Sure, and what better time than World Snake Day, held each July 16 and aimed at raising awareness about reptiles that are too often feared and under-appreciated. Orianne Society celebrates Snake Day. This survey crew including DNR and U.S. Fish and Wildlife Service staff is grubbing for mussels in Ichauwaynochaway Creek. The June 23 survey turned up nine rayed creekshells, more than all of the rayed creekshells found in the southwest Georgia stream from 2008 through 2015. The latest results suggest more favorable conditions for recruitment and survival of the species, petitioned for federal listing. Never miss a memory outdoors with DNR’s new license auto-renew. The system allows outdoor enthusiasts to automatically renew their hunting, fishing and Georgia Outdoor Recreational Pass licenses en masse or individually, while also ensuring they don’t miss out on renewal discounts. Names in the news: DNR Private Lands Program Manager Jessica McGuire and nongame wildlife biologist Steve Raper worked an information booth at the Southeastern Wood Producers Association meeting in Valdosta. Key topics: DNR private lands outreach and conservation efforts to help keep gopher tortoises off the federal threatened and endangered species list. Marietta/Cobb Museum of Art will present 52 paintings by Athens artist Philip Juras that explore Little St. Simons Island's environments Saturday through Sept. 11. The Wild Treasury of Nature: a Portrait of Little St. Simons Island exhibition opens with a reception and signing of the same-named book Saturday night. – Reception, book signing at The Wild Treasury of Nature: a Portrait of Little St. Simons Island exhibition, 6-8 p.m., Marietta/Cobb Museum of Art. Exhibition continues through Sept. 11. – DNR has an eye on the sparrow hawk, with good reason. – Civil War site holds promise for conserving rare skullcap. 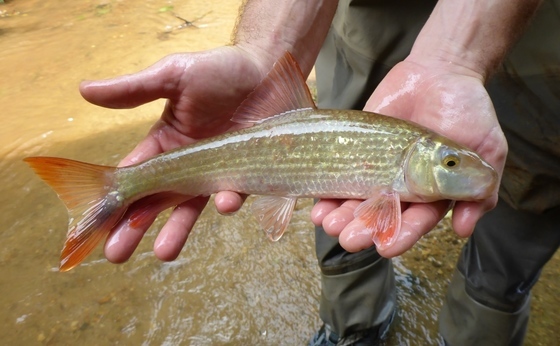 Fishes including blacktail redhorse, Tallapoosa shiners and lipstick darters were caught and released during sampling last month in Walker Creek, a Tallapoosa River tributary in Haralson County. The work by DNR’s Stream Survey Team and nongame staff varied from photographing Tallapoosa bass for fish illustrator Joe Tomelleri, who is completing illustrations of recently described bass species from Georgia, to assessing water quality using fish as indicators of stream health.